Portsmouth goalkeeper Aaron McCarey has revealed he would be willing to extend his time at Fratton Park. 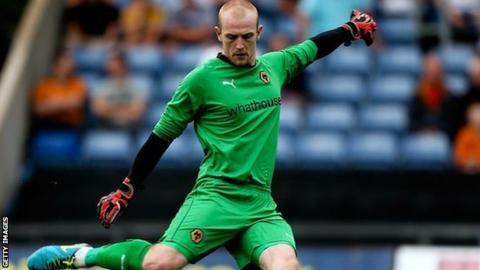 McCarey, 23, joined on a one-month emergency loan deal from Wolves in September, which ends on 20 October. The Irishman kept his first clean sheet of the season in the 0-0 draw with Yeovil last weekend. "Nothing has been spoken about yet but if the club and manager want me to stay I would be more than happy to do so," McCarey told BBC Radio Solent. McCarey, who has previously had loan spells at Walsall and York, is enjoying game-time on the south coast after making just one appearance for Wolves last campaign. "I have moved down for the month and given it my all," he said. "I am starting to feel myself get into match sharpness. "It has been a good little confidence booster."